When I was still at the agency, I used to tell people that I thought Twitter would go away. Don’t get me wrong. I didn’t think the format Twitter made would go away, I just didn’t think Twitter as a company would survive. I was wrong about that but let’s see how they do after the IPO. But I still love how Twitter works. In fact, it’s probably one of the best ways to be involved in the digital space today. Many, many leaders (real leaders, not fake internet famous leaders) are using twitter to reach out to their constituents and listen to the online conversations about their brands. If you want to make a difference in a company, reach out using twitter and you’ll see they are listening. So why are real business leaders, politicians and other farmers like you using Twitter? 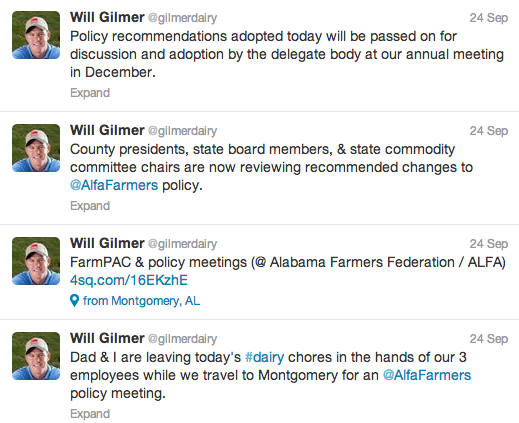 Here are five reasons why they are and why I think you should be using Twitter for your farm. 1. Fastest, easiest and cheapest way to meet your consumers, their food influencers (like reporters, nutritionists and foodies) and tons of other people. To give you an example, I’ve not been in the dairy industry long but by using Twitter, I’ve been able to start following influential dairy people. The tweets they post, the conversations they have with people, the news they pass along – gets me up to date quickly on what matters to them and how the industry functions. Without it, it would probably take several years and many meetings to learn the industry. For a local farm profile, I would follow the people that are most likely going to influence the audience that I want to influence. So locally, it would be your local news reporters (fastest way to get to a reporter is through twitter), your local politicians, your local farm bureaus and, of course, the local foodies. How do you find out who they are? You follow a few, see who they are talking to the most, and you follow them. 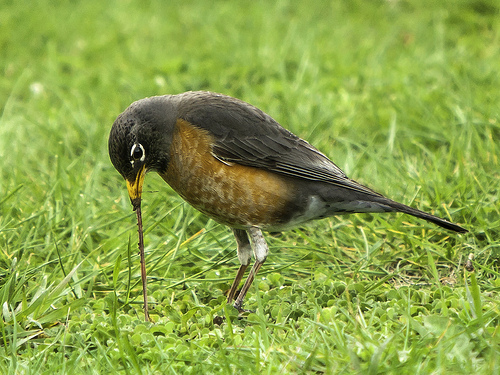 You can also use great free tools like followerwonk.com (where you can search people’s bios) and twiangulate.com (where you could search multiple people’s followers and see who follows both of them like a local news personality and local foodie – those followers could be a good audience to connect with). 2. The power of instant conversations – Join in and contribute or sit on the sidelines, it’s your choice. But there are also consumer conversations that are always ongoing that are hash tagged as well and after you get some experience with the twitter language then I would recommend joining them as well. You can get some great consumer insights into how they perceive the industry and what terms are good for them and which aren’t. Conversations in Twitter are all open (unless you have a protected account or you are direct messaging or DM’ing someone) and people understand that by talking out on twitter you are inviting anyone to join in. This is very different than other social networks. 3. News spreads quickly – your tweet may too. I’ve been told a quote that “if it doesn’t happen on twitter, it’s not news” and we can see with reporters using twitter more and more, the news does seem to be on twitter first. In fact, tweets about an earthquake in the U.S. hit Toronto faster than the shockwaves. If reporters and influentials are using twitter extensively then it goes to say that if you use twitter to pass along news, then it might be picked up by the local reporters in your area – and if it’s really big news or it’s intriguing to a national reporter, it might go nationally very quick. 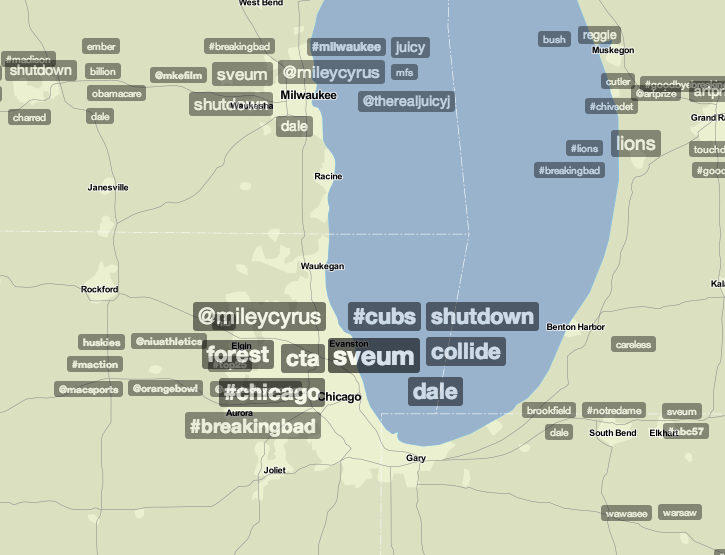 You can see what is trending on Twitter via maps by using Trendmaps.com. The good thing to understand is that news travels fast (really, really fast in twitter) so it’s important to understand your words matter when a tweet spreads. Choose them carefully and under 120 characters so people can retweet it without having to edit them. There are some amazing people out on twitter that just hand over great information on how to do things for free. In fact, it’s one of the best ways to build a following – help people out by giving up your knowledge on what you know how to do. It kinda flies in the face of making yourself irreplaceable at your company. But that was the old way of doing things. You basically make yourself irreplaceable by giving out your knowledge and making yourself an influencer of others. When it comes to a farm profile, giving up information on how you farm, how the cows are, how the feed is, what you are doing and how you are doing it, builds trust with consumers and helps out younger farmers – so they can follow your example and learn from you. It’s ok to talk shop out in twitter and people want you to so they get a better understanding of how farming has changed over the years. I wouldn’t look at it as “education” but more of “insights” or “inside information” on how you farm. I believe that Will Gilmer and Ray Prock are great examples but there are many more out there doing a great job and I’ll highlight on future posts. 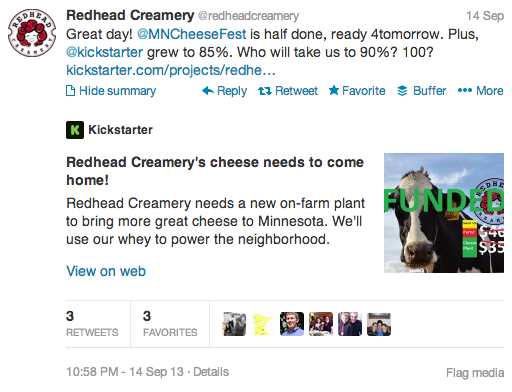 Redhead Creamery raised over $40K for their farm using kickstarter campaign – many donors had nothing to do with farming. You don’t have to only follow people you like – you can see what the competition is talking about. What are they planning? What interests them? You don’t have to “follow” them to see their conversations. You can simply add them to a “private” list and view their information there. You can even join their conversations. You may not be able to change their minds – and definitely don’t enter a conversation to start an argument or fight (that’s no way to influence others) – but at least you’ll be able to read their thinking and understand who influences them. Would you like to set up Twitter for your farm? 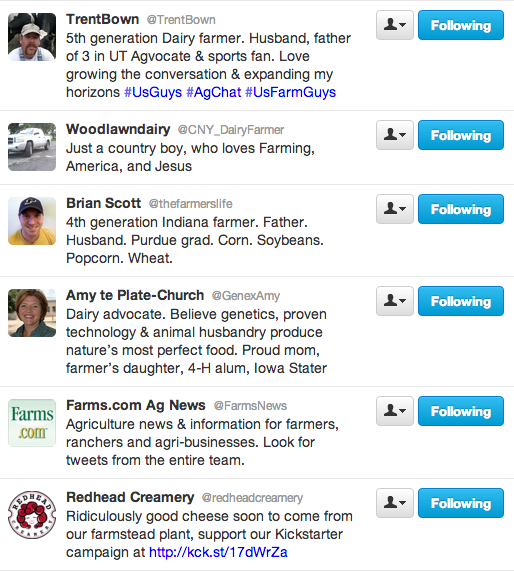 Check out my blog post on How To Set Up Twitter For Your Family Farm in 6 Simple Steps. Of course, there are many cons to this platform. But I believe the benefits of joining twitter far outweigh the cons. These are the five reasons why Twitter is bad and it makes the platform hard to use, especially for beginners. 1.Lots and lots of noise, spam and robot collection devices. When you enter the world’s largest cocktail party, there’s going to be a lot of stuff you really, really don’t care about. The benefits of using “twitter lists” can help keep this noise to a manageable amount. If you are not using lists, I really don’t know how it is going to work for you unless you keep your following count really low. There’s also going to be spam in the internet and Twitter is no different than other platforms. The main thing is never ever click a link that you are unsure of the source. It will happen and you’ll get burned and send out the diet pills links, a bad video or possibly a virus (it happens to all of us). When it does, change your password and then go delete the last application that was added to your profile. That should take care of it. 2. Twitter.com is does not have a very user friendly interface. I don’t recommend using twitter.com for your web or phone application (it is better on the phone). I will walk you through Hootsuite, it’s free and better for your overall digital presence online. You can control more than one social network through it and still have great conversations. 3. Search is getting worse – harder to find the right conversations to be in. 4. Relationships are fleeting – remember this is twitter and social media. These people are not going to come out and join your parade on day one but they might be friendly to you and that’s a start. It’s a great way to discover, intro, and help maintain new relationships with people but if someone unfollows you, don’t take offense. Just move on and help someone else. Maybe they’ll introduce to more people than the last person. Nothing happens overnight when it comes to twitter unless you are a celebrity to start with. You have to pay your dues, meet people, have a lot of conversations and build up your brand. There are plenty of tools to make it easier to talk but nothing is as effective as smart, thoughtful, positive tweets about why you love what you do and why you continue to do it. Remember most people using twitter aren’t in agriculture – you aren’t there to educate them but to give them insights into your farming lifestyle. I’ll have a blog post up soon about how to set up twitter and what you should be tweeting.